Taney Bridge - Luas Bridge Construction in Dundrum. 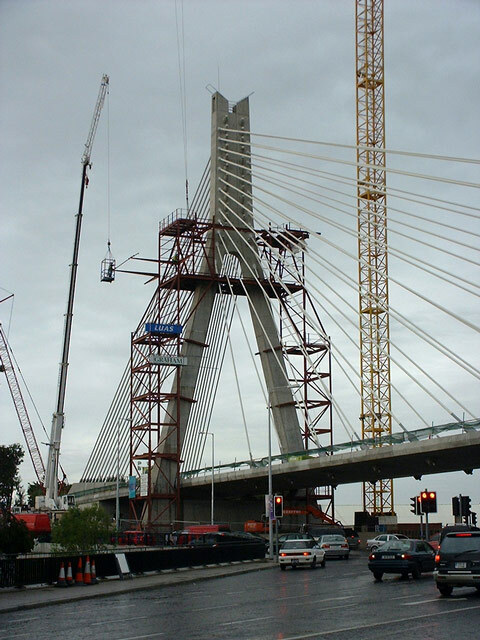 Taney Bridge - this image is one of many showing the construction of Taney Bridge, the Luas Suspension Bridge across Taney Junction/Crossroads in Dundrum, Dublin, Ireland. This is the Stephen's Green to Sandyford Luas Line (Line B). The photos are dated year-month-day, so July 29th 2002 is 020729. Go to the Dundrum index pages. please see the "use a photo" page for information on using these images.